Finding an amazing wedding venue that ticks all the boxes is no easy feat! As wedding photographers, we’ve seen hundreds of different wedding venues around Sydney. We’ve made a ‘best of’ list and have broken it down by type of reception venue; Beach/Waterfront, Garden, and Urban/City. Some of the most beautiful images that we’ve captured have been at weddings in the Northern Beaches. There is so much variety, amazing scenery, cool venues and best of all, really fun couples to photograph! We love photographing weddings in the Northern Beaches, and this article will tell you why. The best wedding venues from the Northern Beaches are featured in this article. Why we love photographing weddings at Greenfield Farm Estate in Martinsville, NSW. From the hosts to the endless photos locations, to the beautiful garden ceremonies, to the magically-lit reception barn, this is one venue that is hard to beat! There's just something about a country wedding. Every time we photograph in the Hunter Valley or Southern Highlands, we always comment after how everyone was so happy, relaxed and really up for a great party! We've shot many weddings at Greenfield Farm Estate in Martinsville, NSW, and we connect easily with the kind of couples that choose this fantastic venue. The first wedding we photographed at Greenfield Farm was back in 2014, and it happened to be the first wedding ever held at the venue, the wedding of Sarah and Con (pictured above). Sarah is the daughter of the property's owner and wanted to have her wedding at the family farm. An open air barn, adorned with thousands of fairy lights, was built for Sarah and Con's wedding, and shortly after the family decided to open up the estate as a venue for hire. 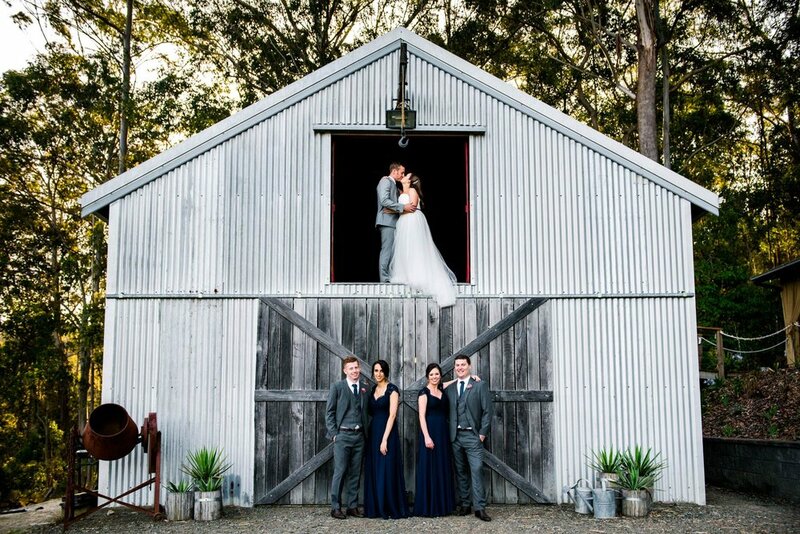 Located 1.5 hours north of Sydney’s CBD, Greenfield Farm is the ideal location for that 'away from it all' wedding, where everyone can truly relax and let their hair down. We also love the fact that the estate and reception area can be so personalised and unique; there are definitely no cookie cutter weddings here! Sophie Field, the event coordinator, is wonderful and will help you craft your vision for the perfect wedding day. We've seen lots of beautiful styling here, from rustic to boho, and it all looks amazing. Now for our side of things, the options for photography are fantastic. Within the estate itself, you'll find a rainforest, winding country paths, gardens, a barn, antique farm equipment, all set amongst rolling hills. The amazing reception space with its ceiling of fairy lights also makes the perfect backdrop for your photographs. Since everything is in the same location, you will get more lovely photos in less time (meaning more party time for you ;). Here are some additional images from weddings we have photographed at Greenfield Farm Estate to get you even more inspired. We know there are a lot of photographers to choose from, however we know all the ins and outs of Greenfield Farm Estate, and we know how to capture the best photos of you and the venue. We know where all the secret spots are for the most stunning photographs, how to capture the most dramatic images of the reception and best of all, how to help you enjoy your day while taking photographs that you'll look back on for the rest of your life! We are also a hardworking small business, and we care about all of our clients as individuals. We only take on a select number of weddings per year so that we can give our clients the customer service and care that they deserve! We'd love to hear from you, so please send us a message or give us a call on 0434 934 766. Please see our wedding photography gallery or engagement photography gallery for more examples of our work. Thinking about an engagement or pre-wedding session? Read all about why it’s a great idea, some amazing locations options in Sydney, and exactly how we go about photographing our couple sessions.